Contact: I live near Brentwood High Street, within eight minutes' walking distance from the railway station (from whence there are very frequent trains, typically every ten minutes, to central London). Additional Info: Confident sight-reader accustomed to short-notice engagements, who studied at Cambridge (incl. Advanced Keyboard Skills) and GSMD (incl. Interpretation through Improvisation with Prof. David Dolan for two years). I am an experienced soloist, chamber musician, improviser, accompanist, pit-band player, and répétitur. I have worked with musicians of various abilities (from the complete beginner to Andrew Kennedy) and in various contexts (including examinations, professional recitals, competitions, auditions, and functions that require background music). In many cases, I have had to sight-read a part, so I know how to deliver good results in situations with limited/no rehearsal time. I can improvise elaborations and interludes in various styles, either as a soloist or in collaboration with other performers. I can also realise figured bass (including on harpsichord or chamber organ), and, given sufficient preparation time, even transpose works of a reasonably tonal character. That said, I hasten to add that (unsurprisingly, seeing as I am a composer myself) I am also delighted to play more modern repertoire. 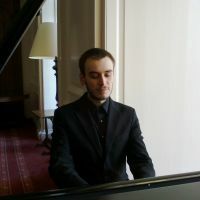 Over the years, I have been engaged by some of the UK's most distinguished ensembles and institutions, such as the Royal Scottish National Orchestra (as harpsichordist for a chamber concert in which I gave three world premières) and the University of Glasgow (as its accompanist for BMus auditions). I am a member of the Incorporated Society of Musicians. I have experience accompanying a range of instruments, voices, and repertoire, including atonal and serial music. A sympathetic chamber musician, I prioritise listening and maintaining good ensemble over burying one’s head in the notes: a good accompanist covers up the other player’s slips and mistakes (including any missed/early/late entries!) in performance. However, having worked as a répétitur on several operatic productions, I am also familiar with the contrasting demands of that role, where the priority is to follow the conductor and furnish clear cues for the singers. £30 per hour is my rate for rehearsal time, provided that no individual rehearsal is less than 30 minutes in length. For accompanying at examinations, competitions, auditions, amateur performances, and amateur recordings, I charge a fee of £36, provided that the duration (that is, including warm-ups, sound checks, &c.) does not exceed one hour. Where it exceeds one hour, the fee is higher. Professional engagements are subject to negotiation -- in such cases, the fee will typically be related to what you are being paid (assuming it is not unreasonably little) for the performance, as opposed to the number of hours' rehearsal. For a duo recital, I would typically expect a 50% share of the fee after promoter's commission. Fees are levied on a per-booking or a per-hour basis, not on a per-person basis. This means that considerable savings may be available to individuals who combine their bookings. Discounts may be offered, at my discretion, for regular/large/shared bookings. *£10 -- central London (assuming no travel required during morning peak).